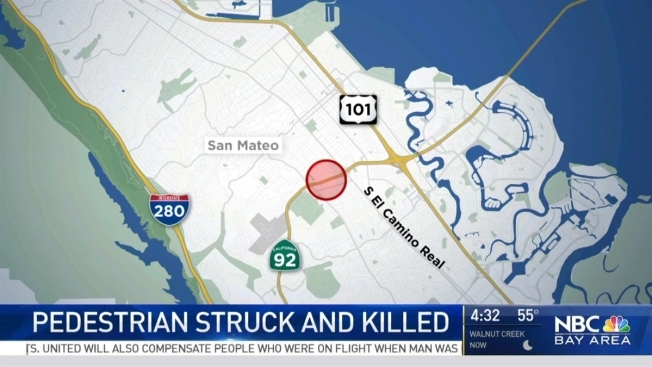 A fatal crash Wednesday night, possibly involving a pedestrian, temporarily closed all westbound lanes of Highway 92 in San Mateo, according to the California Highway Patrol. A man walking in the westbound lanes of Highway 92 in San Mateo was struck and killed by a car late Wednesday, according to the California Highway Patrol. The crash was first reported at 10:10 p.m. on the highway, just west of El Camino Real, CHP officials said. A preliminary report indicated that an SUV struck a pedestrian. At a news conference on Thursday morning, CHP officers said they are trying to identify the man who died and figure out why he was walking on the freeway to start with. The victim was described as a man in his 50s, who was wearing a Stanford hat, black pants and a black sweatshirt. A Sig-alert was issued following the accident, closing the highway's westbound lanes in the area. All lanes were reopened about 10:50 p.m., the CHP said.